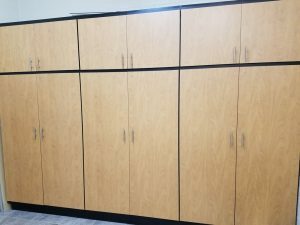 Is installing garage cabinets in Phoenix an expense? Or is it an investment? As we covered previously, garage cabinets are not so much an expense, rather they are an investment that will increase the value of your home. The more equity you build in your home, the better off you will be if you ever decide to sell or refinance your home. While the financial benefits of garage cabinets are a nice bonus, the main reason to have garage cabinets installed is that they will allow you to transform your garage into whatever type of workspace you want it to be. Instead of having a space that is filled with all kinds of miscellaneous things that have grown into a messy pile, you can instead have space where you can easily find anything that you need. When you get garage cabinets the biggest benefit you will have is that you can turn your garage into just about anything you want it to be. Any type of pastime, hobby, or even job that requires an enclosed outdoor workspace is something that you could do in your garage, providing of course that your garage is well organized and designed to accommodate your needs. Instead of wishing you had the space to work on a project you have been putting off, you can now have the space to do just about any type of project you can imagine. The garage in a house is meant to be a space where you can park your cars and store some of your belongings. It is also meant to be a work space that will allow you to do a variety of projects. What it is not meant to be is a disorganized disaster area where anything and everything is just thrown all over the place. Unfortunately, this is the sad state of many people’s garages. The good news is that you don’t have to live this way, you can actually use your garage for what it was intended for. When you have custom cabinet installation done by a professional you can reclaim use of your garage and avoid dealing with a seemingly endless pile of clutter. So they remove clutter. They increase your home’s resale value. And they make your garage. All very good reasons to buy garage cabinets in Phoenix and have them professionally installed.